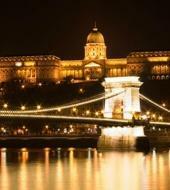 Enjoy an unforgettable bike tour by night through the city of Budapest. See the fully illuminated city and experience the unique atmosphere of one of most beautiful cities in the heart of Europe. Enjoy the wonderful panorama of the Danube, the parliament, chain bridge, and the Saint Stephens Basilika –just to name a few, without the daytime crowd and lit up with special lighting effects. We have fully equipped bikes as well as helmets and security vests available to ensure that you can enjoy the ride without any traffic troubles. We will show you some authentic quirky bars and restaurants where you can stay and have a drink (or two) after our tour. Rather than overloading you with facts and figures, we guarantee to give you a perfect overview of the city and its fascinating history. Children's bikes: Yes, from about 4 years.